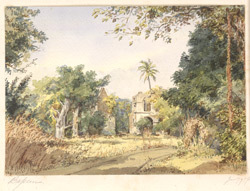 Watercolour by William Carpenter (1818-1899) of the ruins of the palace of the Portuguese General of the North at Bassein in Maharashtra, dated 1851. The image is inscribed on the reverse: 'Bassein Jany. 7th morning' and on the mount: 'Bassein Jany. 7th 1851'. Bassein is situated twenty-eight miles north of Mumbai and was a thriving Portuguese colony from 1534 to 1739 when it was sacked by the Marathas. The river which separated it from the mainland was a convenient route for shipping and made it easier to defend. The Imperial Gazeteer of India states, "during this time it rose to such prosperity that it came to be called the Court of the North, and its nobles were proverbial for their wealth and magnificence. With plentiful supplies of both timber and stone, Bassein was adorned with many noble buildings, including a cathedral, five convents, thirteen churches, and an asylum for orphans. The dwellings of the Hidalgos, or aristocracy, who alone were allowed to live within the city walls, are described (1675) as stately buildings, two storeys high, graced with covered balconies and large windows..."